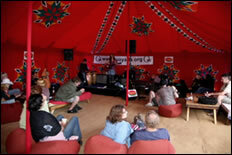 Show your support for local bands at the Kashmir Cafe at IW Festival. After the success of last year, the Kashmir Cafe returns to the Isle of Wight Festival, offering festival goers the opportunity to sit-down, relax, have something tasty to eat or drink whilst being entertained. Housed in a beautiful Indian tent with authentic furniture, the Kashmir Cafe will be playing host to a variety of acts from acoustic solo performances to five piece bands – the best in original music from the Island and beyond. Offering a sanctuary from festival madness the Kashmir Cafe must be sought out by those looking to experience, tasty food, real ale and original music. Also, this year we will be selling award-wining ales from local brewers, Yates’ Brewery. Quay Arts Cafe Bar will be serving breakfast and BBQ’s on Saturday and Sunday from 8am to 4:30pm. 4 Comments on "IW Festival 09: Kashmir Cafe Returns: Set List"
Well done to Mick Smith for getting the Kashmir Bar a part of this years festival, it very nearly didn’t happen. This is great opportunity for Medina High School kids to get a chance of performing at the festival which they otherwise wouldn’t have had. I’m gutted!! I didn’t bother to get a ticket for the festival this year because none of the headliners particularly appealed, but now I’m going to miss out on the chance to see the very talented Holly Kirby and Paul Armfield singing live! Well done to the Quay Arts for getting such a good lineup together. I, too, loved the Kashmir Cafe and my find of the festival, Alex Roberts, performed a brilliant set there on Sunday afternoon. However, I have a huge gripe. What’s the point of inviting these brilliant acoustic and semi acoustic artists to perform and then putting them right opposite a REALLY NOISY fairground ride? GRRRR!